If you receive my website newsletters, you already know about this offer, but if you do not…let me be the first to tell you about a great new tool that is available to administrators, coaches, facilitators, trainers, and professors. 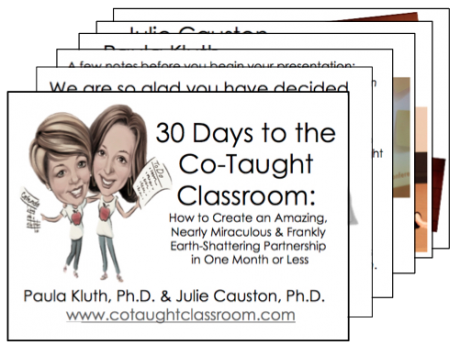 I have just finished assembling a HUGE co-teaching slide deck that anyone can get for free with the purchase of 10 or more copies of 30 Days to the Co-Taught Classroom. If you are responsible for teaching teams about co-teaching, you may be looking for staff development materials. We have you covered. These slides have it all—group activities, summaries of each section of the book, discussion questions, and virtual resources to share. Teach it all at once or present it throughout the year during meetings, coaching sessions, and brown bag lunch sessions. To get the presentation, go to www.cotaughtclassroom.com or contact booksales to place your order. If you are buying direct from us, we’ll send the password to download the file as soon as we place your order. Or, if you buy from another source, contact us with your purchase details and we will send you the code to download the presentation. Finally, we’d love to hear your feedback. Let us know if and how the slides help you educate teachers in your school or district!